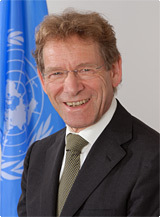 On 1 September 2007, Prof. Dr. Osterwalder joined United Nations University as its fifth Rector. In that role, he holds the rank of Under-Secretary-General of the United Nations. Konrad Osterwalder is a Swiss national and theoretical physicist by education. Born in 1942 he got his education in Switzerland and earned a Doctorate in theoretical physics in 1970 at the Swiss Federal Institute of Technology (Eidgenössische Technische Hochschule; ETH) in Zurich. After one year with the Courant Institute of Mathematical Sciences, New York University, and two years as research fellow at Harvard University he was promoted at Harvard to Assistant Professor in 1973 and Associate Professor for Mathematical Physics in 1976. In 1977, he returned to Switzerland upon being appointed a full Professor for Mathematical Physics at ETH Zurich. He was appointed Rector of ETH in 1995 and held that post for 12 years. In 2006 and 2007 he also served as ETH President pro tempore. Rector Osterwalder has been a Fellow of the Alfred P. Sloan Foundation (1974–1978) and is member of the Swiss Academy of Technical Sciences. He holds an honorary degree from the Helsinki Technical University, is an Honorary Member of Riga Technical University and he has been awarded the Premio Matteo Ricci by the Università Cattolica del Sacro Cuore, Milano.